Long ago nicknamed “the stinking rose” for its distinctive odor, garlic — one of the world's first cultivated plants — is known for its health benefits. Garlic contains a number of vitamins and minerals, including vitamins B-6 and C, manganese, selenium, calcium, iron, copper and potassium. According to “The Encyclopedia of Healing Foods," garlic has been shown to lower blood pressure and cholesterol levels, as well as protect against heart disease, atherosclerosis and certain cancers. 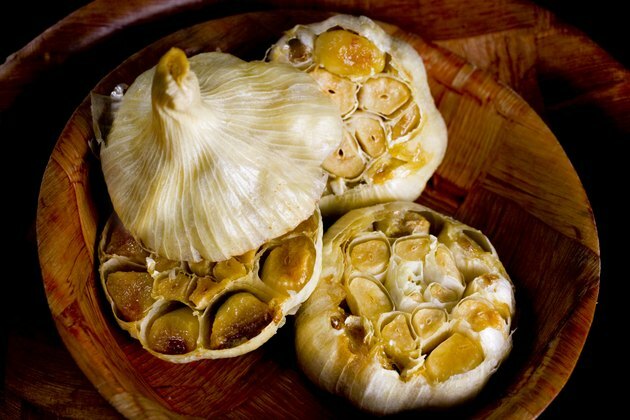 Roasting is a fast, convenient way to cook garlic and incorporate it into your diet. Hold the terra-cotta ring under running water until it’s thoroughly soaked, or put it in a bowl of water for several seconds until it's saturated. Place it directly into the roaster’s cooking chamber. Remove any loose paper from the garlic bulbs. Cut off the top of each bulb to expose the cloves, taking care not to remove too much of the cloves’ flesh. Depending on the size of the garlic, you should be able to fit three to four bulbs in the roasting cup. Pour 2 tbsp. of olive oil per bulb into the roasting cup. If desired, add a dash or two of salt. Herbs and seasonings, such as paprika, cayenne pepper or basil, provide other flavoring options. Place the bulbs of garlic in the roasting cup, cut side down. Put the cup into the roaster and close the lid. Plug it in and press the start button. The roaster will automatically shut off 27 minutes later, after it finishes its roasting cycle. Let the bulbs sit for two to three minutes. Open the lid and insert the plastic handle that comes with the roaster into the handle slot on the hot roasting cup. Lift it out and place it on a potholder. Wait approximately five minutes for the garlic to cool before using it. Remove any loose, excess paper from the garlic. Cut off the tops of each bulb to expose the cloves. As you prepare the garlic, soak the top of the roaster in water so the garlic stays moist as it’s roasting. Place the garlic, cut side up, on the roasting plate. Depending on the size of the garlic, you should be able to fit up to four bulbs on the plate. Drizzle 2 tbsp. of olive oil over each bulb, taking care to cover all of the exposed cloves. Add salt, herbs or seasonings as desired. Put the lid on the plate and place it in a cold oven on the center rack. Close the oven and turn it on to 350 degrees Fahrenheit. Cook the garlic until it’s soft, about 45 to 60 minutes depending on your oven and the number of bulbs on the plate. Remove the roaster with a potholder and place it on a heat-proof surface or another potholder to cool. Keep the lid on for two to three minutes. After removing the lid, allow the garlic to cool for three to five more minutes before you take it out. Before using an electric garlic roaster for the first time, wipe the inside with a damp cloth and wash the removable roasting cup in hot soapy water. You can place the roasting cup in the dishwasher, but not the terra-cotta ring. Wipe the inside of the roaster with a damp cloth after each use. Before using a terra-cotta roaster for the first time, rinse it off with warm water and wash the glazed roasting plate with warm soapy water. Don’t use soap on the terra-cotta dome. Always wash the roasting plate by hand, as it’s not dishwasher safe.